the most commonly used astronomical coordinate systemastronomical coordinate systems. ..... Click the link for more information. , the point at which the sun crosses the celestial equator in March. 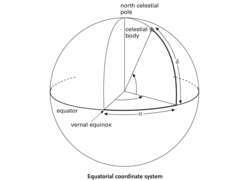 in astronomy, a secondary axis in the equatorial coordinate system. The hour circle of a celestial body is the great circle on the celestial sphere that passes through both the body and the north celestial pole. in astronomy, one of the coordinates in the equatorial coordinate system. The right ascension of a celestial body is the angular distance measured eastward from the vernal equinox along the celestial equator to its intersection with the body's hour circle. in astronomy, one of the coordinates in the equatorial coordinate system. The declination of a celestial body is its angular distance north or south of the celestial equator measured along its hour circle. ..... Click the link for more information. ), such tables must be revised at regular intervals. By definition, the vernal equinox is located at right ascension 0h and declination 0°. vertical circle passing through the north celestial pole and an observer's zenith. It is an axis in the altazimuth coordinate system. ..... Click the link for more information. ; it is equal to the star's right ascension minus the local sidereal time. Because the vernal equinox is not always visible in the night sky (especially in the spring), whereas the sigma point is always visible, the hour angle is used in actually locating a body in the sky. The most widely used astronomical coordinate system in which the fundamental reference circle is the celestial equator and the zero point is, strictly, a catalog equinox, or less formally the vernal (or dynamical) equinox. The coordinates are right ascension (α) and declination (δ), which are measured along directions equivalent to those of terrestrial longitude and latitude, respectively (see illustration). Sidereal hour angle is sometimes used instead of right ascension and north or south polar distance instead of declination. Because of the slow westerly drift of the dynamical equinox around the ecliptic the coordinates right ascension and declination are normally referred to the mean equator and equinox for a standard epoch, which in present use is 2000.0.